Spend the day making and printing collagraphs. Experiment with colour and mixed media processes to produce a series of individualized original prints. If you are interested, see LakeHouse's website to enquire about booking. (seen in the picture below as relection of the floorboards in the tiki). The 'mirror' is in different locations on each variant edition. 5-colour Screenprint on Polycarbonate, 60x60cm, edition of 20. Also, just before Christmas, 3 of Brad's images were showcased on Mr.Vintage t-shirts. The NZ Artist Series designs are strictly limited edition, with only 50 of each t-shirt produced. and is packaged in custom-made personalised wooden gift boxes. I think there are still a few left, if you want one, see the Mr.Vintage website to order. Mr.Vintage t-shirts, limited edition of 50.
called New Zealand Gallery, which came out in October 2010. Good work Brad! I wonder what will be next??? 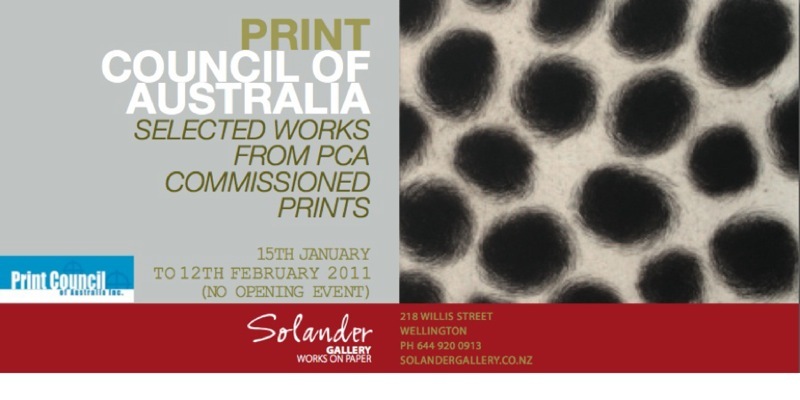 to see the Print Council of Australia exhibition which is on at Solander Gallery. and definitely worth going in for a look if you are in the area. Intaglio, paper size 17x60cm, edition of 12.
with an impressive 27 contemporary NZ printmakers! Congratulations to all you kiwis involved in that, the catalogue looks awesome! Woodcut and stitching, paper size 44x52cm, edition of 7. Did you get to see any print exhibitions over the summer holidays?? Or discover any NZ printmakers we should know about??? Add a comment below or email me, I'd love to hear about it! I enjoyed watching this 'illustrated' TED lecture by Dennis Dutton. It discusses the role of beauty in art from a Darwinian perspective. it is interesting to watch just for the illustrations. Dennis is an art theorist from Christchurch, and the author of "The Art Instinct". This video was made in collaboration with animator Andrew Par. and thought the new cellular series she exhibited in December was interesting. I particularly like the monotypes which look quite spontaneous and intuitive. Marci studied fine art in the United States in the 1990s and moved to Wellington in 2006. Her practice includes printmaking, painting,encaustic and a range of dry media. and runs Snapshot – a studio and periodic gallery space in Island Bay, Wellington. Click on this link to see more of her images. Monotypes are quite a fun way to 'draw' in printmaking, quick and easy. Perhaps a good way to get started for the year? The exhibition runs from the 15 January to 12 February. from emerging and established Australasian artist-printmakers. Subscribers to the Print Council of Australia can then choose a print from these editions. and these works are now found in significant Australian collections. If you are in Wellington over summer then go check it out. and if you see a piece that you love we'd love to hear about it. using a variety of stencils, including photographic silkscreen, on paper or fabric. Being tutored by Kate McLean, maximum of 8 students, cost $205. I wondered if any of you NZ Printmakers can help with this...? and is trying to find a Vandercook SP15 Proofing Press (or similar manual model) in NZ. or if you know someone in NZ that owns a Vandercook please get in contact. Click here for Russell's email or email me if you want phone numbers. including simple paper stencil methods, screen block techniques and more complex photo-screen methods. 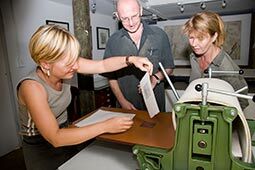 This course covers direct printing techniques such as wood and linocuts as well as an introduction to etching. Enjoy learning printmaking methods from simple forms such as PVA, card & collagraph to woodcut. Experiment with colour and mixed media processes to produce a series of individualized original prints. A technique of printing a sharp-edged image using a hand held screen. of the upcoming printmaking opportunities I know about. then please feel free to email me the details to add to the blog. to exhibit, network and upskill this year! 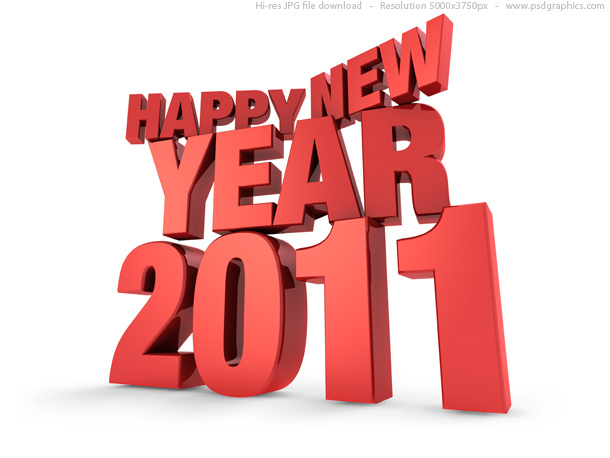 Happy New Year to all you Printmakers & blog readers! I've been so appreciative of all the emails I've had over the past few months. Your input has been essential in making this blog so successful! so keep sending me your exhibition invites, printmaking news and links! 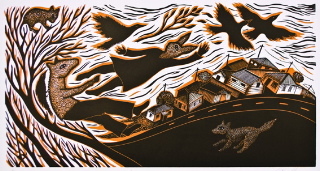 then please remember to tell them all these amazing NZ Printmakers we have on this blog! Got any print-related New Years Resolutions?? ?